BMS Design Ltd have extensive experience of providing complete 3D laserscan data processing services. Over the past 10 years we have converted 1000’s of raw STL data (3D scan) files into sold surface parametric 3D CAD models. Our customers find our combined precision engineering knowledge and practical reverse engineering experience is really valuable when interpreting and converting 3D laserscan data. 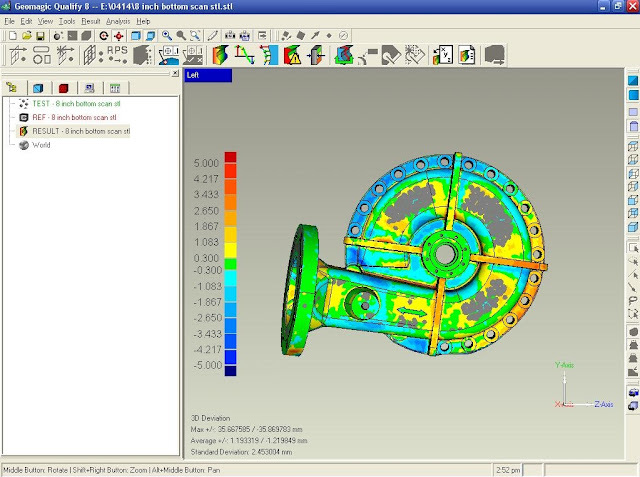 Our specialist reverse engineering software is used to transform 3D scan data and polygon meshes into accurate 3D parametric models and has features for capturing exact geometry, giving you the power and flexibility to choose the modelling method that works best for your application be it reverse engineering, product design, rapid prototyping and analysis. Our experience originates from the application of 3D scanning and reverse engineering for the precision engineering requirements of race car design. However we now provide reverse engineering services to a diverse range of industries including oil and gas, automotive, aerospace, tool and die, master mould design, consumer product manufacturing, civil engineering, heavy equipment and electronics. As part of the reverse engineering service we also provide valuable advice and opinion on interpreting the 3D CAD drawings and models generated from the original 3D scan data. Supply a number of leading 3D scanning outfits throughout Europe. Work to aggressive lead times. 24-hour turnaround in certain circumstances. 22 highly experienced CAD engineers. Geomagic Studio transforms 3D scan data and polygon meshes into accurate 3D digital models for reverse engineering, product design, rapid prototyping and analysis. Geomagic Qualify enables fast, accurate, graphical comparisons between digital reference models and as-built parts for first-article inspection, production inspection and supplier quality management. Delivering best-in-class reporting capabilities, Geomagic Qualify’s powerful yet simple report designer allows you to design and customize inspection reports to meet the requirements your organization. Geomagic Qualify is also the first inspection software that allows you to share your results with fully interactive 3D models. Collaborate on the inspection process. As computer-aided design (CAD) has become more popular, reverse engineering has become a viable method to create a 3D virtual model of an existing physical part for use in 3D CAD, CAM, CAE or other software. The reverse-engineering process involves measuring an object and then reconstructing it as a 3D model. The physical object can be measured using 3D scanning technologies like CMMs, laser scanners, structured light digitizers or computed tomography.